For plantar fasciitis sufferers, wearing sandals isn’t always an option. Some people experience pain from the moment they step out of bed, meaning they must put on supportive socks for plantar fasciitis or even put on shoes and orthotics. Fortunately, many companies offer sandals for plantar fasciitis that keep wearers comfortable and prevent further injury to tendons. 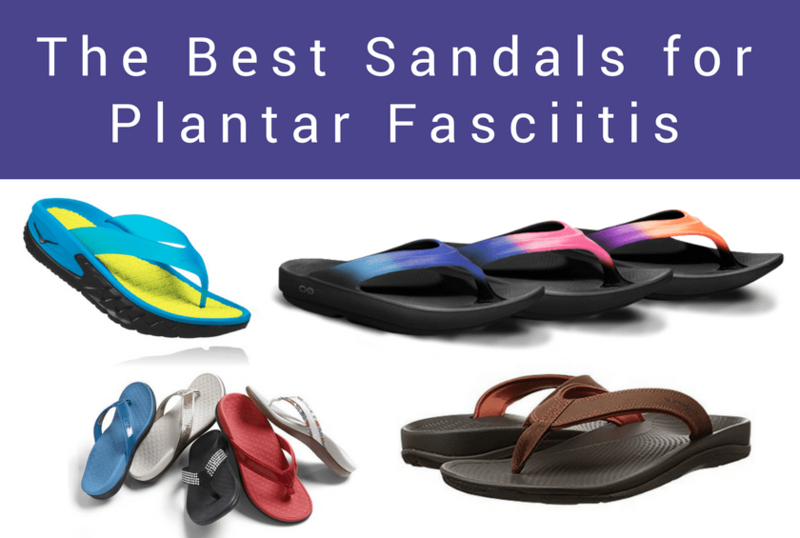 While you may not be able to slip on your favorite flip flops when dealing with plantar fasciitis, one of our top nine choices for sandals may help. The selection of colors plus sizes to fit every foot may just make the Oofos sandals your new favorite flip flops. For non-flip flop lovers, the brand offers slide sandals as well. 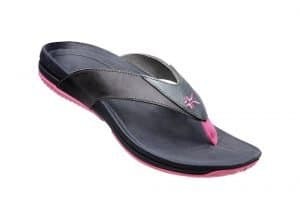 The molded flip flops have a heel height of about one inch which offers substantial arch support and cushioning to combat the pain of plantar fasciitis. Wearers liken walking on Ooofos to walking on memory foam, an appropriate description considering the dense foam construction. The manufacturer also notes that the materials are high shock absorbing, measuring at 37 percent higher than other materials. Whether you wear them out for summer activities or slip them on for walking around the house, Oofos sandals are durable and comfortable for long-term wear and low-key physical activities like walking. If they get wet or dirty, just throw them in the wash for a quick clean. While there are both unisex and men’s/women’s colors, all models maintain lots of cushion and high arch support. That said, finding the right size may prove a challenge depending on foot width and toe length. Keep in mind that even though some colors gender-specific, all the sizes are unisex. Hoka One One has both flip flop style and slide sandals, and with separate sizing for men and women, they hone in on proper fit. The top layer of both models uses EVA for a soft feel while maintaining the stability and durability you need in a support shoe. Rubber soles keep your traction on any surface while grooves within the shoes keep your feet from sliding around. Unlike solid-construction shoes, these sandals for plantar fasciitis use two layers of material to cushion and comfort your feet. Since Hoka One One’s focus is on recovery shoes for athletes, they have an eye on performance. These sandals for plantar fasciitis are one product line of many for people dealing with ankle and foot positioning problems. In addition to walking and leisure sandals, they also offer athletic shoes for other outdoor activities. The wide midsoles of the Hoka One One sandals give you stability and shock absorption, but the cushioning and lightweight materials also help ease the transition from jarring athletic endeavors to a natural stride. All of the brand’s shoes, including sandals, use meta-rocker geometry, which is a fancy way of saying that the shoe encourages natural gait and helps you move forward. The relatively thick heel propels your foot forward, and the low-profile toe area keeps you moving. Since the brand began with orthotic shoe insoles, Powerstep knows that consumers appreciate affordable and ready-to-wear methods of alleviating pain and discomfort from plantar fasciitis and other conditions. 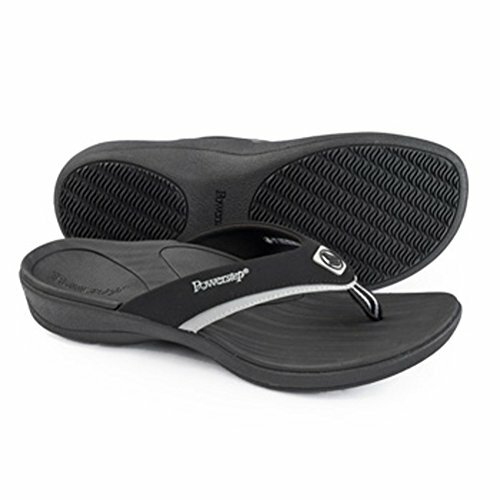 Powerstep Fusion Sandals come in both women’s and men’s styles, but the contoured arch support is present in both. The shoe’s design cups the wearer’s heels and keeps feet from moving around. Built-in arch support helps position the foot and ankle to reduce pain and discomfort, keeping you adequately aligned for walking and hiking activities. Shock-absorbing midsoles have ample cushioning and reduce the energy you need to keep moving. The outsoles have non-slip tread and texturing to further protect against slippery surfaces. Unlike other sandals for plantar fasciitis that utilize solid construction, the Powerstep sandals feature straps with fabric lining. For those with sensitive skin or an aversion to chafing against rubber straps, the soft lining is a welcome addition. Synthetic leather and neoprene form the base of the Superfeet Outside 2 sandals, with both men’s and women’s variations. All versions utilize a deep heel cup to keep your feet firmly inside the sandals, but the look is more like casual flip flops than a bulky orthotic. A rubber sole helps with slip resistance, and the toe post is a combination of nylon webbing and synthetic materials. The surface of the shoe uses texture to keep feet from slipping side to side, and the t-strap prevents you from sliding forward. The foam inner helps absorb impact and move it away from your feet. This, along with the brand’s “Superfeet shape,” keeps you comfortable while catering to high arches. Thanks to their use of synthetic materials, these shoes can handle water activities and dry out quickly afterward, a perk for summer activities. Vionic is another company that cares about making quality orthotic footwear that doesn’t look like orthotic footwear. Their women’s Tide sandals come in multiple colors, and some models feature decorative sequins. 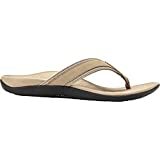 Vionic Tide men’s toe post sandals may lack sequins, but their streamlined design makes them look like a regular pair of comfortable flip flops. Both men’s and women’s sandals for plantar fasciitis use the brand’s Orthaheel Technology that keeps feet properly aligned. Rubber outsoles with pattern tread give wearers traction, and a soft toe post and foam-lined straps keep the sandals secure and comfortable. EVA midsoles are medium-density, flexible, and lightweight, ideal for walking and relaxing in any environment. Forgiving straps and added style elements make Vionic Tide sandals a fashionable and functional choice for plantar fasciitis pain, and the arch support mimics the support of Vionic orthotics. For those who routinely wear orthotics from this brand, the sandals will carry over the fit and support of your athletic to leisure shoes. In contrast with other top-ranking orthotics, Kuru Kala uses full-grain leather and pigskin lining for its sandal straps, adding a sense of luxury to this utilitarian flip flops. Women’s and men’s style options cover multiple color choices to align with any wardrobe. Like your favorite Kuru insoles, the Kala sandal uses foam to mold the shoes to your feet, paying close attention to the heel area. While flat sandals or flip flops put pressure on the heel bone and fat pad, Kuru insoles cup the heel and “hug” it. The “Kurusole” focuses on positioning your foot correctly so that you can enjoy summer activities without pain and tension in your joints, tendons, and bones. Continued support along the arch aligns feet, and a low-profile toe box keeps things moving. The leather surface keeps feet from slipping, and rubber soles in contrasting colors add interest and offer grip while you navigate streets, beaches, and beyond. Although this sandal only comes in full sizes, a complete sizing guide points you in the right direction for the ideal fit. Versatile orthotic sandals with solid rubber construction give you tons of heel lift and arch support in a lightweight package. The Spenco Fusion 2 comes in women’s and men’s sizes and a small assortment of colors. Antimicrobial technology keeps the sandals from developing odor issues, and a deep heel cup maintains a therapeutic position. Rubber soles give grip and cushion, focusing on the forefoot with a gentle surface that’s forgiving as well as supportive. A metatarsal dome and 5mm of heel lift create optimal conditions for plantar fasciitis sufferers to experience relief without the use of uncomfortable boots or equipment. For people who have difficulty wearing orthotic sandals with rigid support, the Spenco Fusion 2’s offer cushioning to aid the transition. At the same time, people with very high arches can also find relief from pain and positioning problems with these sturdy orthotics, along with cushioning that keeps the surface feeling as light and airy as walking on a cloud. If the Gone for a Run PR Soles name doesn’t say it all, this brand centers around running gear and apparel for serious athletes. If you have plantar fasciitis and need relief while walking or recovering from runs, you need serious sandals for the task. 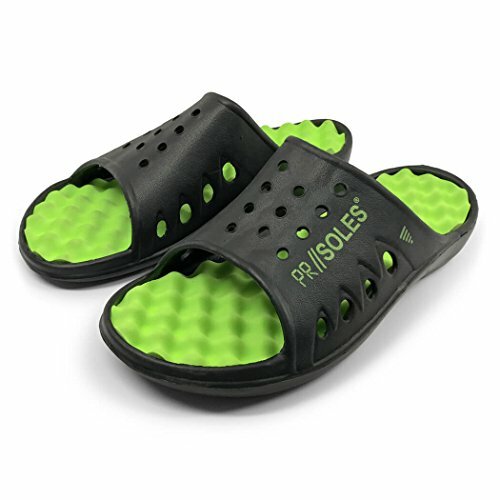 Gone for a Run PR Soles are slip-on sandals that the company intends for pre and post workout footwear. That said, you don’t have to be an athlete to take advantage of the support and recovery aid that is an excellent pair of orthotic sandals for plantar fasciitis. These sandals use Acupoint soles, a foam footbed that forms around your foot for a custom fit for each wear. They also help aid in foot recovery as a type of acupressure, stimulating nerve endings in your feet. The little nubs can help increase circulation in your feet and help prevent fatigue from physical activity. Lightweight materials and a breathable over-foot strap keep you comfortable even in warm weather, making these ideal as both indoor slippers and outdoor footwear. However, for people with very high arches, the support these sandals deliver may prove insufficient over time. That said, the massaging feature is unique and often welcome for athletes or people who are on their feet all day and seek relief outside of their regular footwear or orthotics. Telic has earned awards for its shoes, and their wide availability makes them an easy choice for arch support and comfort. With deep heel cups and medial arch and metatarsal accommodations, Telic flip flops and sandals maintain the right pressure on your feet to keep you walking comfortably. 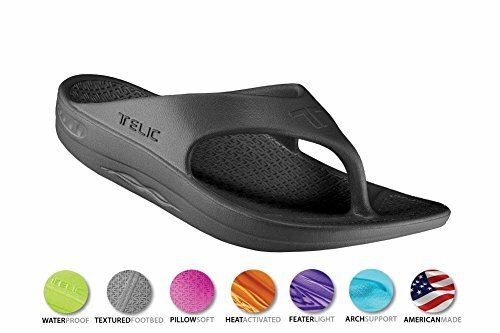 With a slight heel rocker, Telic’s sandals help relieve heel pressure and maintain forward movement. Whether you choose a flip flop, slide, or z-strap sandal, you’ll feel a gentle massaging effect while wearing your Telics. 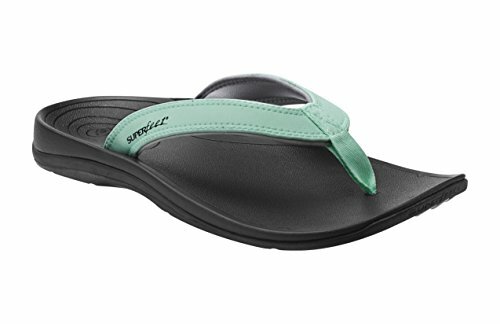 The Telic unisex slide sandal has a synthetic sole and foot strap. Cutouts help maintain airflow and keep your feet cool, and the lightweight construction means they don’t weight you down. Adequate arch support means you can wear these as alternatives to orthotics whether you have plantar fasciitis or are recovering from a foot injury. Wearers appreciate the cushioned footbed, and the Novalon material that Telic uses helps increase shock absorption and promote rebound as you walk. These durable materials also help maintain the life of your sandals. How to choose the right sandals for plantar fasciitis? When shopping for sandals to help relieve plantar fasciitis pain, be sure to find a pair that are supportive with a high arch. Supportive and sandals may not sound like they go in hand, but that’s what makes these sandals different than your standard flip flop. Good sandals for plantar fasciitis have a high arch – almost like an insert or orthotic – that helps realign the foot to a more natural position. 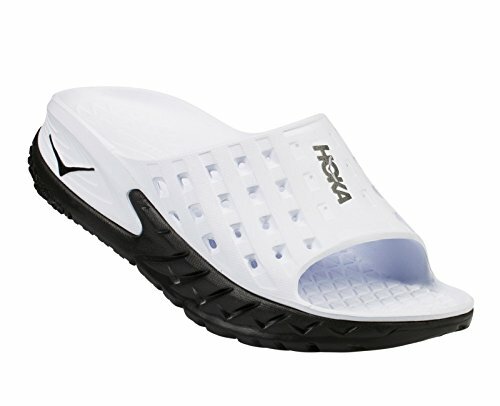 Some sandals like Oofos and Hoka have a soft, cushiony arch. This style is also cushioned in the heel to help ease plantar pain. Other models like those made by Vionic or Superfeet are harder and sit higher inside your arch. Either style does the same thing: takes pressure off the spot in your heel where plantar pain strikes. Another consideration should be whether you buy a flip-style sandal or a slide. Either should work and will depend on your preference. If you are unsure, we recommend a slide. Wearing a flip-style sandal may put extra strain on the tendons in your feet. How do I treat plantar fasciitis? Plantar fasciitis can be maddening. It can come for no reason. And disappear just as quickly. Only to have it suddenly emerge once again months later. To treat plantar, it’s advised to stretch and ice your feet, especially on the arch and heel where you feel pain. A good option is to freeze a water bottle and roll your foot on top of it. If you have been wearing old shoes or unsupportive footwear, it’s also a good idea to change to a new pair. Will inserts help me with plantar fasciitis? Yes, probably, but with a caveat. They’ll likely provide more support (which is good), and they’ll also likely relieve some pain (also good). But the downside is that they don’t do much to heal plantar fasciitis. Inserts for plantar are better used for pain relief rather than as a way to cure plantar. What are the best running shoes to wear for plantar fasciitis? Like sandals, the best running shoes for plantar fasciitis have tons of support and cushioning. The support will help ease plantar pain. And the cushioning will help you cope with everyday pain. We’ve gathered up the top running shoes for plantar fasciitis here.